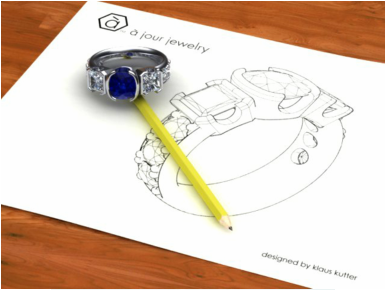 ​Request a Free Design-Redesign Appointment with Klaus Kutter of A Jour Jewelry and get ready for a very satisfying a very rewarding experience. Used to get back to you to confirm or change your appointment. I am open Tuesday through Saturday. I am closed Mondays and Sundays. Please let me know what time slot works best for you. I will get back to you with a confirmation. Used to contact you for confirmations of changes more promptly. I do not under any circumstances share your data. Please tell me your dreams, ideas and wishes it will be fun. Tell me your ideas your style. I'll guide You to your absolute dream piece. Be it for an engagement an anniversary or a spectacular unique creation for yourself. You let me know. Over the last 25 years I have created hundreds of pieces in four different countries. I am very good at sensing what you like. Give me about an hour of your time. This fact finding Design Session is Free. You answer my questions I draw some sketches, we look at pictures often pictures that you bring with you. Once I have a feeling for your style and preferences I will start the design process. I usually start this while you are at home. I email you multiple photo quality pictures of your future piece and the process is rolling. You critique my ideas until you are 200% comfortable with the result. Then I will make your master piece here in my studio. My Experience taught me that the finished result always looks better than the pictures. That is what all my customers tell me when I pull out the finished piece. We can work with stones and jewelry that you bring with you or I will source the perfect gem for you. You will find my style and process relaxing without pressure. My job is to make you look good and to make you happy. I truly mean that.